Up Next: Meet Our Beekeeper June 21! The people of the Episcopal Church of the Advocate have a dream. Since moving onto our scruffy 15-acre site in 2014, we have been working to transform it into a place of hospitality, worship, and contemplation, and a regional resource for collaborative social ministry and the arts. In 2015, The Advocate began collaborating with individuals and organizations outside the church to host three “tiny homes” on our site, for individuals who would otherwise be homeless (PeeWeeHomes.org ). Now we are beginning a second collaboration, the Piedmont Patch, to restore native flora and fauna displaced by the rapid urbanization surrounding the property, and to cultivate keepers of Creation. The Piedmont Patch will create a network of involved neighbors and provide numerous opportunities to educate and engage people of all ages and backgrounds. We believe that in deepening connections with creation and with our community, mindfully tending and keeping the land and teaching others to do the same, we will honor God. 2) continue the transformation of five acres of the Episcopal Church of the Advocate’s site into a food-producing and restored native species habitat, offering our site to the community as a place of hospitality, worship, and eco-justice education and engagement. 3) develop digital and other educational resources for sharing in the community, the Diocese, and across the Piedmont. Permeating this whole collaborative project is a desire to restore God’s creation and God’s people to one another, to be church. The Piedmont Patch Collaborative will, we hope, serve as a prototype for other churches and land holders across the Piedmont. intergenerational and a variety of learning styles. 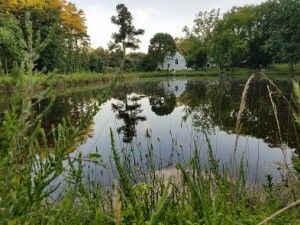 We imagine the Advocate Pond and grounds enriched with diverse well-adapted native plants that will attract and nurture an array of wildlife, including butterflies, bees, birds, frogs, turtles, and small mammals. Surrounded by rapid urbanization, the Church of the Advocate’s acreage can serve as a sanctuary for homeless wildlife increasingly displaced by bulldozers, asphalt, and concrete. 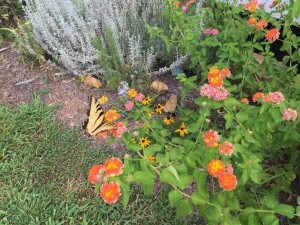 Over time, such native plantings require less maintenance than traditional ornamental plantings, most of which do not meet the needs of native wildlife. The project has an educative component, engaging school children and graduate students and inviting all who are responsible for patches of Piedmont land to learn how to create vibrant native sanctuaries that serve rather than harm God’s creation. Ideally, we can lead other congregations and other neighborhoods to adopt this concept of native sanctuaries, building refuges of hope for native wildlife and havens of peace and beauty for humans one patch of piedmont (and beyond!) at a time. The Project will also include education on invasive exotic species and their removal — why it is important, how it contributes to sustainability. The Piedmont Patch Collaborative is grounded in a belief that the environment and our natural resources will be better sustained, and even thrive, as organizations and individuals work to cultivate one patch at a time. 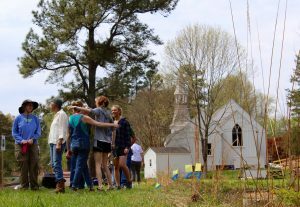 The Project is envisioned as a collaborative effort of the church, the town, the NC Botanical Gardens, and individuals with knowledge and skills to share, such as Cathy Bollinger of The Piedmont Gardener. We hope the Piedmont Patch Collaborative (like the Pee Wee Homes Collaborative) will serve as prototypes that can be scaled and replicated in a variety of church, public, and private settings. Breaking News!!! The Advocate receives a Stewardship of Creation Award from The Episcopal Church. Here’s an article about native and non-native wildflowers and bees.